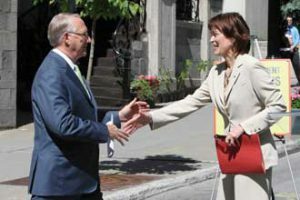 University and city officials joined McGill Principal Heather Munroe-Blum and Tremblay at a ceremony Friday, May 28, to celebrate the occasion, which is complementary to McGill’s Greening Lower Campus initiative. Although many restrictions have been in place since May 18, when preparations and landscaping work to transform the street began, McTavish is now officially a haven for pedestrians. Parking on the street has now been eliminated, vehicular traffic substantially reduced and deliveries restricted to between 7 and 11 a.m. Emergency vehicles will continue to have access to the street. And vehicles transporting people with disabilities and local residents will continue to have access via McTavish to the public lane located between the Bronfman Building and the University Bookstore. The by-law that made the McTavish initiative possible was approved at a Ville-Marie borough council meeting last month. It came after months of extensive negotiations between the University and the Ville-Marie borough. Tremblay in turn congratulated McGill for the variety of green initiatives it has taken. It’s not the first time McGill and the City have collaborated on a project of this kind. The two parties worked together earlier this year to create a bicycle path along the west side of University St. between Pine Ave. and de Maisonneuve Blvd. The Greening Lower Campus initiative is designed to enhance the University’s natural environment, increase green space, decrease paved areas, improve landscaping, minimize motorized vehicles on the lower campus – and ultimately create a pleasant, green oasis within the downtown urban core. Some 144 parking spots have been eliminated. Limited parking for McGill guests and visitors is available north of the James building. A McGill sponsor can reserve a spot, subject to availability, for an academic or administrative activity, or McGill approved event, by submitting an online form. “This is an extraordinary effort on the part of the McGill community, giving up parking spaces, giving up all of the amenities that come with vehicular traffic, to say that it’s more important to have the safety and community feeling that we have, and to be able to enjoy our beautiful green spaces,” Munroe-Blum said. For more information on the changes on McTavish St. and the Greening of Lower Campus, visit www.mcgill.ca/masterplan/lowercampus.